The homelessness ‘safety net’ suffered another blow last week when Westminster Council decided to prevent homeless households from bidding for social housing for 12 months after the Council accepts it has a duty towards them. The Council plans to discharge its duty in most cases by identifying private rented accommodation for them. Housing now receives quite a lot of media coverage but very little is devoted to homelessness. Last week there was a short Panorama programme and a few media outlets picked up on the latest increase in the number of households in temporary accommodation. But this is an era when it seems even ‘Cathy Come Home’ would leave the country unmoved. 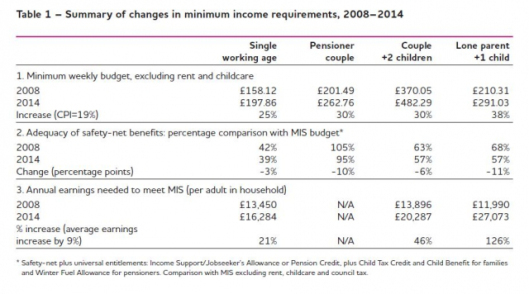 #DWPChaos Parked on ESA WRAG for a year now out of system ……..
………Indeed this was Iain Duncan Smiths GOAL all along. Right my complaint has been ongoing ever since migration from Incapacity Benefit and indeed it has turned into a giant of a complaint spanning a couple of years as the blogs above show (they are spread all over this blog so decided to bring them all onto one page) . There are moral points of view regarding this complaint which as you know our government does not take into consideration and thus it is my believe that this is partly why they are going wrong also after all not everyone fits in the same bag but that is what they are trying to do. Soaring house prices have driven o­rdinary families out of vast swathes of the UK – particularly the capital where the average price of a home rocketed by 18.5% last year. Britain’s housing crisis is worsened by weak legal protection for private tenants, who can be forced out of homes they have lived in for years at a few weeks’ notice. This protest is trending on twitter, but surprise, surprise no mention of it on BBC! Demonstrators have set up a camp in the grounds of Westminster Abbey to protest against cuts to financial support for disabled people. 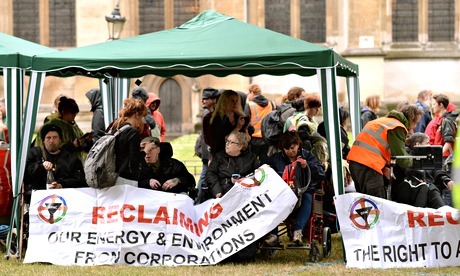 Members of disabled people against the cuts (Dpac) pitched tents and said they intended to occupy the green outside the doors of one of Westminster’s most recognisable landmarks until 22 July. 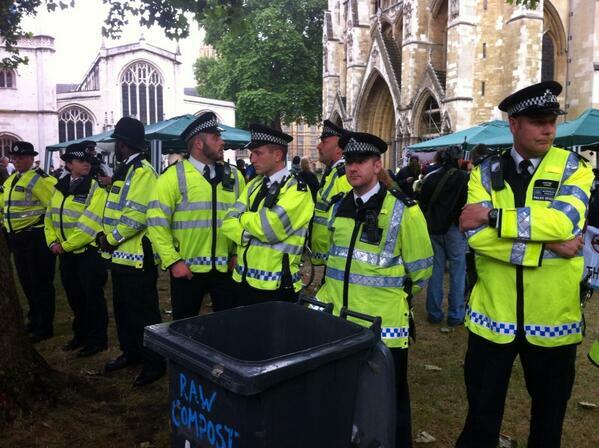 The protest is reminiscent of the occupation that sprang up at St Paul’s Cathedral in 2011.